ORAC Super Fruit Formula is also an WL Aloe Vera Juice Concentrate. Supports occasional indigestion, bloating, regularity, energy and optimum health, 1oz daily. Safe for children, adults, seniors, athletes, and even pets! Aloe Life Superfruit tastes delicious and is the perfect compliment to Aloe Vera's health action in the body. Supports occasional indigestion, bloating, regularity, energy and optimum health, 1oz daily. Safe for children, adults, seniors, athletes, and even pets! Superfruit contains 17 extracts including; Grapes, Berries (Wild Blueberry, Black Currant, Bilberry, etc.) Pomegranate, Resveratrol, Acai, and Quercetin that bring an approx. ORAC value of 2400 in every serving to support body wellness for the whole family. [ORAC is defined as Oxygen Radical Absorbance Capacity*]. Also, contains 82% WL Aloe Vera Concentrate. Serving size: Take 1oz (2 Tbs) before a meal is best 1-3 times daily. May drink undiluted or mix with liquid. Try it you will love it, Satisfaction Guaranteed! Gives a great energy boost and supports digestion because of the bitters in the juice!10% discount on 4 or more. * Tuffs University made ORAC to help individuals understand the importance of antioxidants from foods that support healthy aging. Superfruit is always in my refrigerator! It tastes Delicious and I love that it has high antioxidants with the Whole Leaf Aloe Vera Concentrate! 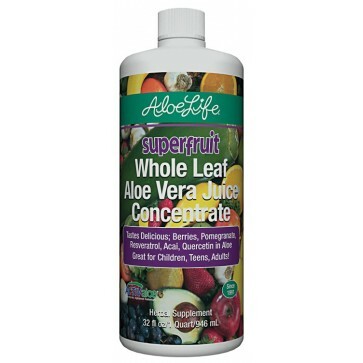 I alternate between the Aloe Gold juice by Aloe Life and the Superfruit like a dessert Aloe that supports health! My daily Energy is enhanced and since taking the Superfruit and the Daily Greens my Skin is more youthful than ever. If you have the desire to stay healthy after 50 I suggest you try out these products. I never want to be without them!